Компания "Stearman-Hammond Aircraft Corporation" была создана в 1936 году и позволила конструкторам Ллойду Стирману и Дину Хэммонду объединить усилия для разработки самолета Hammond Model Y и запуска его в серию. Самолет получил обозначение Y-1 (Y-125), он ДальшеMore>>> рассматривался как простой в пилотировании и был предназначен для широкого круга заказчиков. Самолет представлял собой свободнонесущий низкоплан балочной схемы с центральной гондолой, в которой рядом располагались два кресла, а двигатель Menasco C-4 мощностью 125 л. с. с толкающим воздушным винтом располагался сзади. Шасси - неубирающееся трехопорное, размах крыла - 12,19м. Y-1 строился в небольшом количестве и имел недостаточно привлекательные летные характеристики, поэтому позже был разработан вариант Y-1S с двигателем Menasco C-4S мощностью 150 л. с., который на высоте 915 м развивал максимальную скорость 209 км/ч. Всего удалось построить 20 машин. Model Y использовался в качестве учебно-тренировочного в голландской авиакомпании KLM, а также проходил оценочные испытания в ВМС США й британских ВВС. Последние приобрели самолет у KLM. Машина, получившая регистрационный номер R2676, была списана в начале 1942 года. ABOUT a year ago Mr. Vidal, of the U.S. Department of Commerce, startled the American aircraft industry by stating that he believed that there was a market for 10,000 easily flown, safe aeroplanes, provided they could be sold for 700 dollars each. It subsequently appeared that he might be granted a fund to assist him in proving the truth of his contention, but the money was not forthcoming, and so he called for bids on twenty-five small economical aircraft to replace the machines in use by inspectors of the U.S. Department of Commerce. Last month a contract was awarded to the Hammond Aircraft Company, of Ypsilanti, Michigan, for fifteen of the originally specified twenty-five at a cost of 2,190 dollars each. According to Western Flying, it was stipulated that the machine to be ordered must be capable of clearing a 35-foot obstacle 800 ft. from a standing start; that it must be capable of being brought to a stop within 400 ft. of the same obstacle, cleared in a straight and controlled glide by a private pilot; that no movement of the control or sudden loss of power should cause either a spin or a steep recovery dive; that the undercarriage should withstand a landing with a vertical velocity of twenty feet per second; that both pilot and passenger should have an uninterrupted view; and that the machine should be capable of being brought to a stop in 150 it. 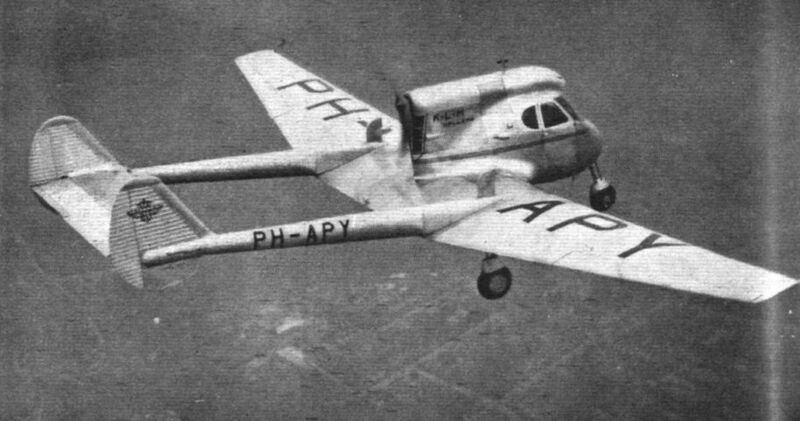 from a ground speed of 45 m.p.h. The Hammond Model Y will resemble few aeroplanes that have been produced during the past few years - with the exception, perhaps, of the Stout "Skycar." It will be a low-wing three-wheeled "pusher" cabin monoplane of all-metal construction with the pilot and passenger seated side by side. The tail will be carried on two booms and the engine specified is a four-cylinder inverted Menasco. But it is in the three-wheeled undercarriage that the real interest lies. 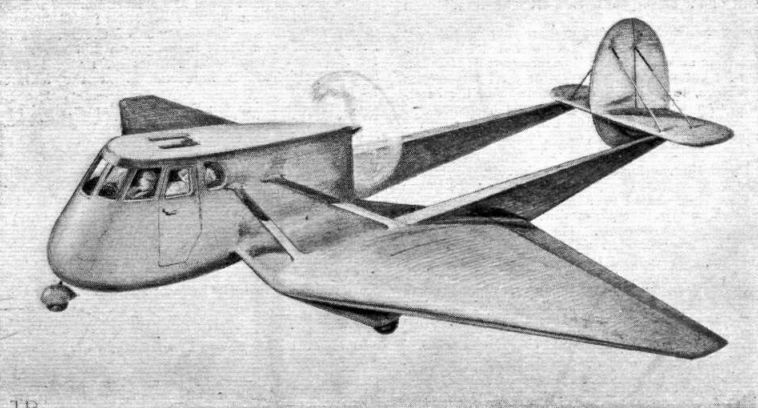 By arranging two normally braked wheels, braced through the wing by four struts to the cabin top, and an additional fully-castoring wheel in the nose, a number of operational advantages should be obtained, the most noticeable of which will be the ability to use the brakes really hard at all speeds without nosing over. It is claimed also that the gliding angle can be made very steep for landing in small spaces, and that the actual landing can be made simply by pulling tho stick back. In any control position it will be impossible to stall the machine. A good, but not exceptional speed range is promised - 35 to 110 m.p.h. Demonstrations will be made in March next year. FOR three important reasons the Stearman-Hammond "Y," which was demonstrated last week for the first time in this country, is of more than usual interest. In the first place, it represents a type which has been built round the tricycle type of undercarriage - and, as "Indicator" suggested in his article on the subject last week, this development really demands a clean sweep of many existing ideas. Secondly, a very real attempt has been made in its design to simplify (or, rather, to modify) the control layout so that any normally intelligent car driver should be thoroughly at home in it within a short time. Thirdly, the machine represents the first production fruits of the U.S. Bureau of Air Commerce's drive towards safer and easier flying for the average man or woman. Among less important reasons are that it is of the pusher type, with all that this arrangement represents in the way of unlimited forward visibility and comfort, and that it is one more machine to continue the trend towards all-metal construction in the private-owner class. The fact that at the present time its price in this country is likely to be high is neither here nor there. If the demand in the States should justify the move, no doubt the Stearman-Hammond people will put the production on a mass basis and we shall be able to buy it for a sum which will be attractive to the ordinarily interested and well-off individual. Probably a twin-engined four-seater on the same lines would be a better all-round proposition for the world market. This particular machine has been bought by K.L.M. for instructional purposes, since the next additions to this company's fleet - whether D.C.4S or Boeings is not yet settled - will undoubtedly have the tricycle type of under carriage. First Officer C. C. Steensma, one of the company's pilots, flew it over and gave a very convincing demonstration of its various capabilities. Unfortunately some complicated Customs ruling adequately prevented anyone from flying in the machine either as a passenger or as a pilot, so no first hand impressions can be given. 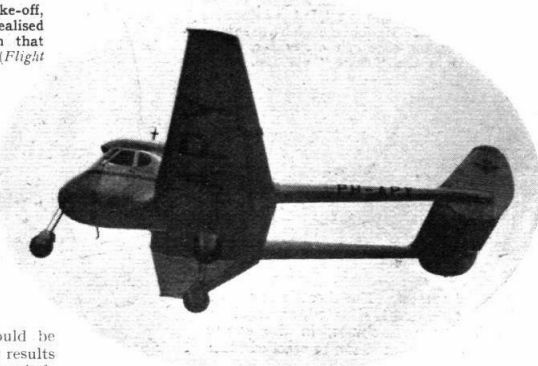 However, Mr. Steensma showed that it was at least as manoeuvrable as any other light aeroplane in the air and a great deal more manoeuvrable on the ground; that sink or glide-in landings could be made with impunity; and that a cross-wind landing results in neither a trailing wing-tip nor a sharp swing into wind. The wind was blowing at 10 m.p.h. or probably more, and the machine has no movable rudder, so that it was impossible for the pilot to cheat by providing artificial drift. 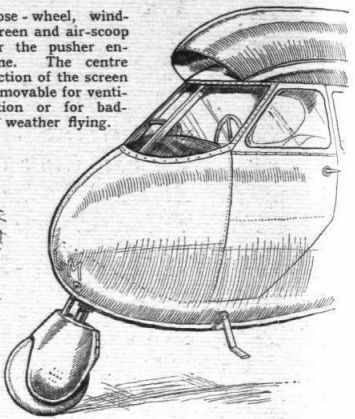 The undercarriage just takes it, though with little keel surface one would expect the machine to swing down-wind without the positive control provided by the steerable nose-wheel once it is firmly on the ground. 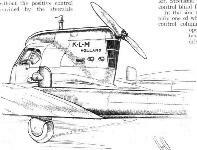 In last week's issue the special characteristics of the tricycle undercarriage - foolproof landings and directional stability on the ground - were described and explained, so we may pass straight on to the control system of the Hammond. This, with its simplification, would not be a practical proposition, needless to say, without the tricycle arrangement, so that some undercarriage comment will be necessary. It will suffice for the moment to say that this landing gear has a stroke of 18 inches and will accommodate a vertical velocity of 20 feet a second - which is a good deal faster than the semi-stalled sinking speed of the machine and is equivalent to a free drop of 6 1/2 feet or so. As already explained, the Hammond has no controllable rudder. Instead there are two fixed but adjustable fins which are normally arranged with a slight splay-out to provide directional stability in the air. Turns are wade on the differential ailerons and the elevator alone. Presumably the sort of jagging movement usually given to the ailerons in order to lift a wing after a bump is not likely to produce a turn of more than a degree or two, and the only difficulty likely to be experienced would be while flying on the instruments alone. Mr. Steensma told us that the technique of accurate two-control blind flying is, in any case, soon mastered. In the side-by-side cabin there are five major controls, only one of which is used in ordinary flight - the wheeled control column. This is of the swing-over type and operates in the usual way except that, when taxi-ing, the aileron wheel is used as when driving a car, since its movement turns the nose-wheel. Incidentally, this nose-wheel movement has some slight action on the flying characteristics, the drag tending to assist the turn in its initial stages. The throttle is of the plunger type and is situated, as usual on the American machines, in the centre of the dash so that it can be reached from either seat. On the pilot's right there is the large flap lever which has three ratchet-controlled positions - off, 20 deg. Down and 40 deg. down. At his feet are two pedals. That on the left, when depressed, lowers the flaps 20 deg. from the position in which they, are already set. In other words, if the main lever is fully forward and the flaps are up, its depression produces a 20-deg. movement, while if, as is normal during the approach, the lever is fully back (flaps at 40 deg. ), movement of the pedal simply depresses the flaps farther for the landing. 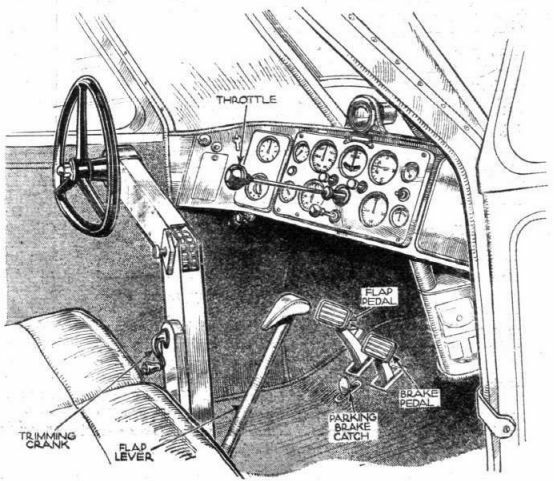 This arrangement, in the case of small-field flying, permits the pilot to "lever" the machine off the ground before it would otherwise be ready to fly, and also allows that last bit of drag to be applied at the end of the approach - in each case without the need for removing the hands from the wheel or the throttle. The pedal on the right applies the brakes on the main undercarriage in the ordinary way and there is a little parking catch just below it. A small crank on the control column operates the elevator tab. This is used only for accurate hands-off trimming, since there is practically no difference in the engine-on and engine-off trim. The approach can, of course, be carried out in any variation of the normal manner, or, alternatively, on sit-down-and-do-nothing lines with the machine trimmed in a 50 m.p.h. glide right into the ground. The elevator control is limited so that the machine cannot be fully stalled without a preliminary dive and pull up. Even then the stall appears to be quite innocuous. Apparently, if one is so inclined, the machine can be brought all the way in with the control column right back, though this course of action is not likely to be recommended in bumpy conditions. So far as general comforts are concerned, the Hammond cabin is reasonably wide for two people and the amount of lateral space is comparable with that provided in the Hornet Moth or the Whitney Straight. There is a large door and fixed step on each side, and a good deal of attention has been paid to the soundproofing and ventilating arrangements. Maps and incidentals can be accommodated on a shelf behind the seats, while there is a large luggage compartment beneath the engine. The machine is sold with full electrical and night-flying equipment, including a generator and electric starter. K.L.M. 's machine is fitted with a supercharged C-4 Menasco of 150 h.p., but the standard machine has a 125 h.p. engine, and the performance figures in the panel on this page are those for the normal type. Cruising speed (75 per cent, power) 110 m.p.h. Distributors: N. V. Kon.-My. "De Schelde," Vlissingen, Holland. Model Y в испытательном центре НАКА в Лэнгли, май 1936 года. ALL IN ONE: Three very modern features appear in the latest version of the Stearman-Hammond "Y" monoplane. A tricycle undercarriage for glide-in landings and ground manoeuvrability; the pusher arrangement for comfort and forward view; and all-metal construction for ease of maintenance. With a Menasco C.4 (125 h.p.) engine the maximum speed is 120 m.p.h., the landing speed is 40 m.p.h., and the cruising range 550 miles. 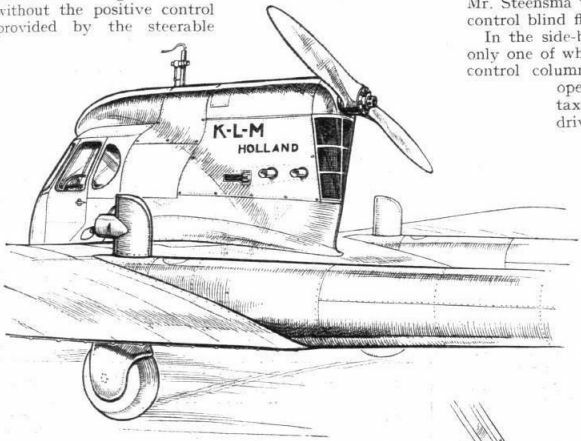 An example of the Stearman-Hammond is at present in Holland and it may shortly be seen in England. N. V. De Schelde, of Vlissingen, hold the European rights for this singularly interesting machine. The Stearman-Hammond Model "Y-1S" Two-seat Light Cabin Monoplane (150 h.p. Menasco C-4S engine). A good impression of the general lines of the Stearman-Hammond can be obtained from this aerial view which was taken immediately after the Croydon demonstration. Though unconventional, the appearance of the Hammond is not displeasing. 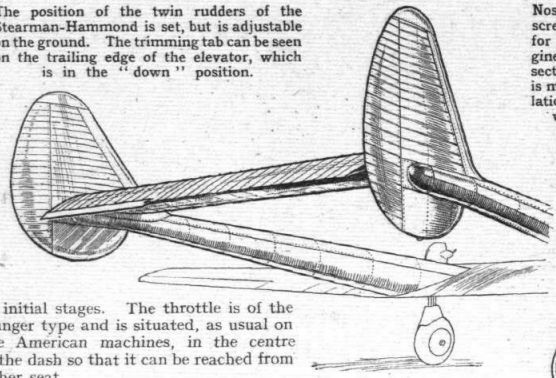 In the picture of the take-off, the amount of undercarriage movement can be realised when the position of the wheels is compared with that in one of the two sketches on the following page. First Officer Steensma, who flew the machine over. It is the custom of K.L.M. to give the younger pilots every possible chance of showing what they can do and of gaining new experience. Steensma has, in fact, so far done all the flying with this machine for K.L.M. A sketch showing the control and instrument layout; this sketch, when seen beside the photographs, also gives an idea of the range of forward vision provided for the occupants. Nose-wheel, windscreen and air-scoop for the pusher engine. The centre section of the screen is movable for ventilation or for bad-weather flying. In spite of its high position the Menasco engine is very neatly cowled. The structure on the roof air-scoop carries the pitot head and venturi. The position of the twin rudders of the Stearman-Hammond is set, but is adjustable on the ground. The trimming tab can be seen on the trailing edge of the elevator, which is in the "down" position.